This week has flown by. I'm gonna tell you the truth...I don't really like going to work. It's not that I don't enjoy working, it's just that I enjoy working for myself...doing things I choose, when I choose. I know most people would...but I actually know some people who don't mind going to work for the man. I suppose it's just that I'm a free spirit...and I don't like to be caged. HA HA HA...okay, I'm making myself laugh now. I mean, it's totally true...but why am I telling you? Probably because it's been an insane week at work which means I haven't had much time to peruse all of your tasty blogs and really immerse myself in them. Luckily I had a few posts half done, so I finished them at the beginning of the week and "scheduled" them to post automatically (love this feature). But, I hadn't picked a Tyler recipe yet, and Friday was closing in. Fast. Too fast! So yesterday, which was actually my only day off this week I started flipping through some Tyler cookbooks and found a fairly quick recipe...that I had the ingredients for, bonus, so I started. But, as days off sometimes go, we decided to surprise the kids by hustling them into the car and going out to eat (Mexican, imagine that...Milanesa de Pollo Torta, yum!!) and to see a movie (UP!...so, so, so good-go see it now). So, I stopped mid-recipe and finished hours later...but it was okay, it's the kind of recipe that allows for such folly. Yes, sometimes I pretend I live in the days of Jane Austen. Strawberry-Lemon Puddings from Dinner at my Place p. 81 by Tyler Florence serves 4 2 c. strawberries, hulled & halved 1 Meyer lemon, juice only (personally, I think this fruit is made up..I've never been able to find one. I used 1/2 lemon, 1/2 orange) 2 Tbs. powdered sugar 1 pint heavy whipping cream 1 c. powdered sugar, plus 1 Tbs. for garnish 1/2 c. store-bought lemon curd although I'm pretty sure you could use homemade ;) 1 store-bought pound cake ditto on the homemade Combine strawberries, lemon juice, and 2 Tbs. of powdered sugar in a small saucepan; place over medium heat. Cook and stir for 4 - 5 minutes, then remove from heat to cool. 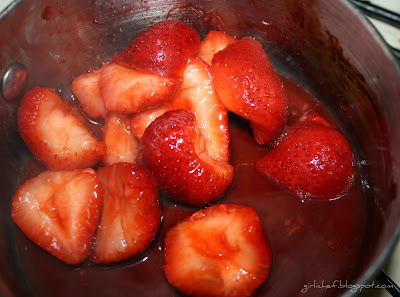 Remove 4 strawberry halves from saucepan and reserve for garnish. 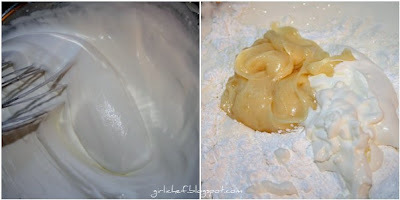 Whip heavy cream in a large mixing bowl until soft peaks form. Fold in the 1 c. powdered sugar and the lemon curd, a little at a time, until combined. Set aside in the refrigerator while you prepare the cake. Preheat oven to 350 degrees F. I actually used the toaster oven for this...it worked beautifully and I didn't have to use any gas or heat up the kitchen. 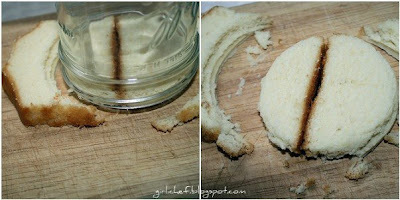 Cut pound cake into 1/4" thick slices. Using an inverted 6 oz. ramekin, carefully cut out 8 rounds. (The rounds should fit snugly inside of ramekin itself). My pound cake wasn't big enough, so I put two slices together and cut with a jar the size of the ramekin. No need to worry about it being in 2 pieces, because you can't actually see them once it is assembled. 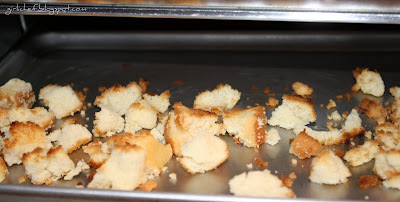 Break the remaining scraps of pound cake into coarse crumbs and toast on a baking sheet in preheated oven or toaster oven for about 5 minutes, until golden brown and fragrant. 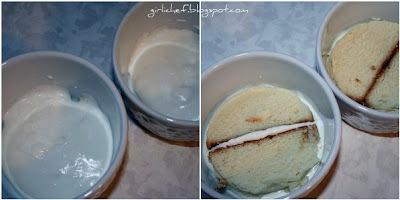 To assemble, start with a layer of lemon cream on the bottom of each of the ramekins, followed by a pound cake round. Next add some strawberries and lemon cream. Add another layer of cake. Drizzle the final cake layers with syrup from the strawberries. Top with a swirl of lemon cream. 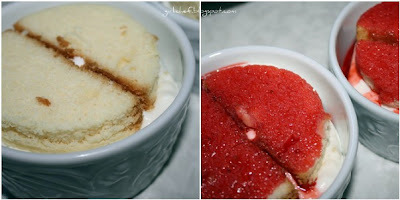 Sprinkle with toasted pound cake crumbs and garnish with a reserved strawberry half. Dust with powdered sugar. Serve! And there you have it...a lovely, fluffy, sweet and dreamy whipped thing for this Tyler Florence Friday. And believe me when I say that this was divine. I think I'll make this for a special occasion or a party next time, because it looks like a lot of work, but it's not a lot of work...and a taste makes you roll your eyes back into your head. So... Don't forget to head over to Tyler Florence Fridays to see what everybody else cooked up with Tyler today. Girli, it's 5:19 a.m. where I am and I want this right now. Oh, I'll definitely be making this one! YUM YUM! Oh, a taste that makes your eyes roll back in your head.. LOVE that description. How could one not want to try it after that! Looks fabulous! 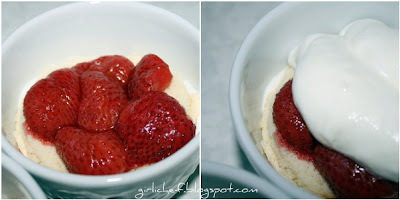 I LOVE this dessert and am so going to make it! And the final result is just beautiful! And I also think Meyer lemons are made up. Great post and an awesome dessert! Hopefully you will have some "down" time this weekend? I so know what you mean about working. I do not enjoy working outside the house. I'm an indoor cat. I love the combo here of strawberries & lemon. And, cheers for you for surprising the kids with dinner & a movie. suuuwheeet - but I guess you know that - and a pound cake crouton - ooo la la! MMMMMMMMMMMMMM... now that SERIOUSLY looks like heaven on earth! This looks so delicious! I really want to go and pick strawberries soon. I have had Myer lemons. They are very good. Especially for lemonade! I used to work in an organic market and we sold them. You can't get them for very long. What a wonderful dessert! I'm a not so much Meyer lemon person. I don't get the excitement they cause. I'm going to try this as soon as we have strawberries in our local green markets. I love this. Easy and delicious. OMG!! that just looks gorgeous!!!!!! You had me at lemon curd! I agree with you on the work thing. It looks like a lovely and tasty dish! Wow! This dessert is awesome. I am going to buy some lemon curd and pound cake to have on hand to pull this together whenever I get strawberries. I am so thankful I am retired - I know what you mean about working for the man. Hang in there. I could totally go for one of these right now. They look amazing! This definitely looks like a special occasion dessert. Mmmmm...Nicely done. Tyler's recipes are always delish!! Heather, this is lovely. It's the kind of dessert I would love to have on a date-night dinner with my honey. Luscious looking strawberries. So funny! I have the same opinion of Meyer lemons.. and other ingredients not available to me here. Looks divine, I wish I could reach into the screen and grab one. This dessert is fabulous end to a dinner party that I'm having this weekend perfect! ooh they look yummy!! and mexican food - mmmmmmmmmm!!! So pretty! I'm sorry to hear about your job, I remember feeling like that! I got my salt in the mail today! I'm so excited! I laughed out loud at the part about the Meyer lemon - so it isn't just me that can't find one! 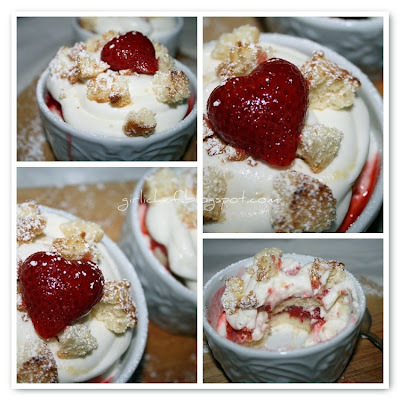 What a great recipe - and I just so happen to have fresh strawberries! OK, now you are just making me drool! This look amazing--love the lemon-strawberry combo! Too funny on the Meyer lemon--they are tricky to locate here! I love fruit desserts---they're so healthy. The fruit totally negates any other calories that might be lurking. Yummy. It's almost strawberry season here in RI, this is on the list of things to look forward to. yum! These puddings look heavenly! I've long thought Meyer lemons a mystery until I found a bag hidden among other citruses in my store, but now they're not in season anymore, so even Wegmans doesn't have them. What a scrumptious dessert!! And I'm with you on the meyer lemons, I have yet to see one myself. oh man...what a light, refresing, and delicious dessert! and I understand what you mean by enjoying work when you get to do things you choose, what and when and how. I'm a fellow free spirit! Okay, that looks amazing! And yeah, Meyer's do exist - though I think ya gotta live in California to buy 'em in a store. I have a tree (really a shrub) that I bought 2 years ago and keep in a large pot. Last year I got about 1/2 dozen lemons off of it. They really are different - a bit milder lemon and very good. This year my tree had a bunch of blooms, but they fell off! I think I have exactly one lemon growing on it right now LOL. Maybe it'll bloom again over the summer. i've made this before and totally agree with your assessment. i love your pictures for this, they look great. 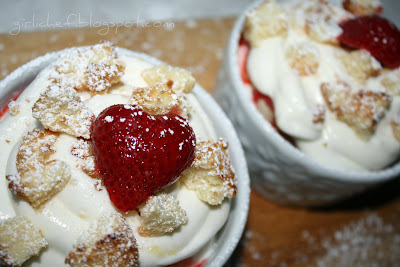 especially the little heart shaped strawberry on top! :) and i've never seen a meyer lemon before either. oh my gosh....they look too cute to be eaten! You are the queen foodie in my book my dear! Have a fun weekend! You now have me dreaming of fluffy, whipped confections. What a sweet dream it is - all based on those scrumptious photos. Real life hits me also - as a freelancer - there are jobs I love and jobs I ... err... don't love. But dreamy, whipped, soft fluffy desserts help you get through them. Ohmyohmyohmy! These are just beautiful and so perfectly delicious. And I looove the strawberry that looks like a heart . . . ! Posts in advance...that would make life so much easier, I must find that feature!! These puddings look perfect, can't wait to try it! I have had the same problem with time getting away from me this week. This dessert certainly seems like it made up for it however! This sounds absolutely perfect. This looks beautiful! 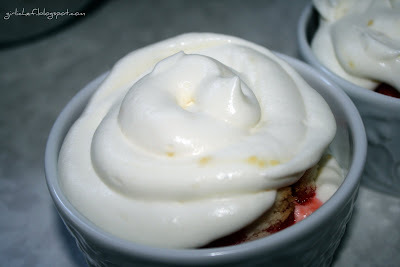 I love cake and custard/whipped cream combinations, my favorite kind of dessert, actually! LOL on the Meyer lemons, Heather! When I lived in CA, there were lemon trees in our yard & I could not get over how different and delicious the lemons tasted compared to what I was used to. I assumed it was the difference between fresh & shipped. Finally I realized they were a different variety-- yep, the Meyer lemons. I understand they are a cross between an orange and a lemon, which makes them especially sweet and fragrant. It's only in the last few years I've seen them available in stores like Whole Foods, and not very often. I love them, and buy them whenever I see them. We had them all the time in CA, but I guess they only ship at certain times of year. A harmonious combination...I believe they make a perfect Valentine's Day dessert. I have to say, I have twice managed to find some meyer lemons, but only twice, and I'm not exactly in the Southern US to get them. Keep looking, you will eventually find them, but it probably won't be until around Christmas. MMMMM! This recipe has my name written all over it!